Last week, I wrote about being more observant to find opportunities and also on being overwhelmed, so go check that post out too. Yesterday, I read a great article as I mentioned about how flaky people these days are. They don’t show up for meetings, they say “maybe” to coming to our event, they postpone, don’t answer calls, etc. Essentially, they just avoid being accountable. And what do most people use as an excuse? Being busy. That’s what I’m talking about in today’s video. 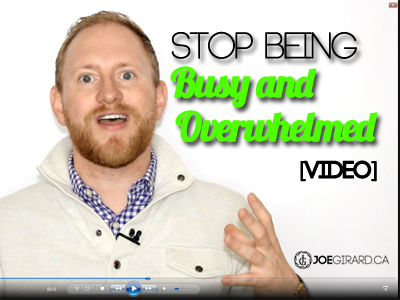 What are you really busy doing? All you had to do was get up each day and not die. That’s it. Since then, we have seemed to over complicate things, right? Watch the video and I hope it helps you strip away all the stuff you don’t need to do and to focus on what is most important. What are you doing each day that perhaps you could stop doing? Can you find more time to build relationships and have more fun? an you simplify and get more done? And of course, leave comments, share this post and reach out to connect with me.